The ALT Conference is just one week away and I’m looking forward to reforming the ALTC Social Media Supergroup with Martin Hawksey (on live stream) Richard Goodman (on media tweets and replies), Chris Bull (on photography), Scott Farrow (on camera), and me (on keynote live tweets). This will be the fourth year that we’ve provided social media coverage for the conference and it’s always a rather daunting, though very rewarding task. Although I regularly live tweet any conferences and events I attend, live tweeting the ALT Conference keynotes in an official capacity is a rather different affair, as it’s important to ensure tweets are as factual, neutral and representative as possible. It’s quite a different experience from tweeting thoughts and comments on my own account. This is something that I reflected on in my CMALT portfolio. Sometimes it’s hard not to be a little overwhelmed by the responsibility of live tweeting ALT’s prestigious keynote speakers, all of whom have made a significant contribution to the domain of learning technology. This year is no exception and I have to confess that I’m thrilled and just a little apprehensive about live tweeting three women who I have admired enormously for many years and who have had a significant impact on my own career as a learning technologist. Maren Deepwell, CEO of ALT, needs no introduction; under her guidance and leadership, ALT has become an active and inclusive organisation that represents the interests of its members and truly espouses its core values of participation, collaboration, openness and independence. As a CEO leading a national organisation, Maren is also a personal inspiration to me and to many other female colleagues, and her commitment to supporting and promoting the work of women across the sector is always to be admired. I’ve known Amber Thomas for many years and was lucky enough to have the opportunity to work with her on the UKOER programme between 2009 and 2012. Amber provided the technical vision and strategy for UKOER and we worked closely together when Cetis delivered the technical support for the programme. It’s no exaggeration to say that it was Amber’s vision of OER that shaped my own early thinking around open education. Amber always has a clear vision of the affordances and limitations of education technology and brings a thoughtful and thought provoking approach to everything she does. I haven’t yet had an opportunity to meet Tressie McMillan Cottom but her work has been recommended to me so often and she is spoken about so highly by so many women who I greatly admire that I’m delighted to finally be able to hear her speak in person. I really hope I can do justice to capturing her opening keynote. Maren Deepwell, Lorna M.Campbell & Rich Goodman, ALT C 2017, CC BY, Chris Bull Photographer. 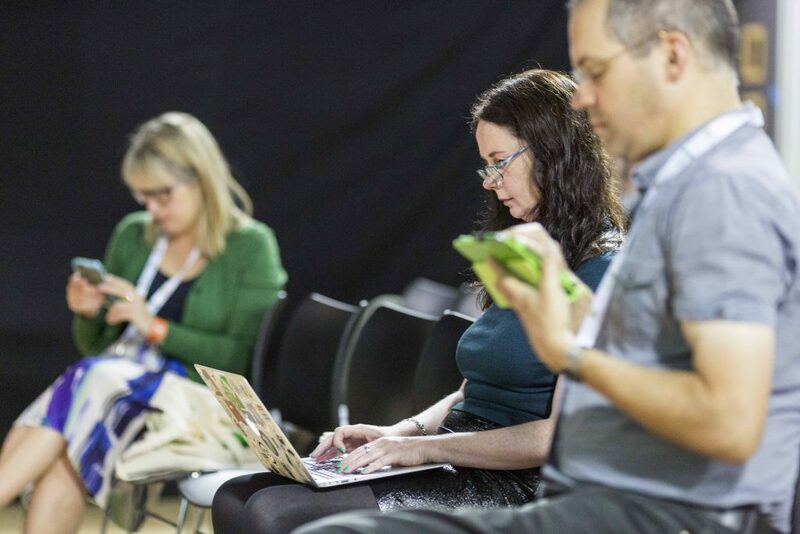 This entry was posted in Women in Tech and tagged altc, higher education, ukoer. Bookmark the permalink.